The effort is part of the Growing Up in Singapore Towards Healthy Outcomes (Gusto) study to find out how their mothers’ pregnancies impact them as they grow up. 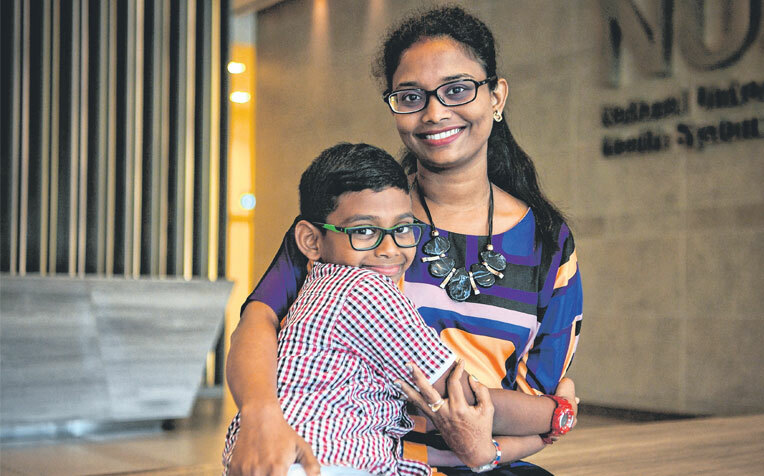  Eight-year-old Marully Ioseff Benjamin and his mother, Madam Mislia Supar, 42, are both part of the Growing Up in Singapore Towards Healthy Outcomes study. Eight-year-old Marully Ioseff Benjamin and his mother, Madam Mislia Supar, 42, are both part of the Growing Up in Singapore Towards Healthy Outcomes study. Since he was born, Marully Ioseff Benjamin Marully Uhum has been in and out of the hospital more times than he can count. He has undergone tests to track his brain activity, eye movements, body fat percentage and a myriad other factors – even though he is perfectly healthy. The eight-year-old is one of more than 1,000 children whose growth a team of scientists has been tracking for the past nine years. Their biological samples now fill 370,000 test tubes kept in 11 laboratory freezers – each two to three times bigger than a refrigerator. The study has also yielded 169 papers published in scientific journals to date, and its findings have changed national health policy. “Papers are good to have, but knowing that you’ve made a difference – that’s very satisfying,” said Professor Chong Yap Seng, who leads the study. The study is a collaboration between the National University Health System, KK Women’s and Children’s Hospital, and the Agency for Science, Technology and Research’s Singapore Institute for Clinical Sciences. It started in 2009 with 1,247 babies, eight in 10 of whom remain in the study today. Researchers took pains to ensure that both mothers and children were comfortable. For example, babies had to go for magnetic resonance imaging (MRI) scans within a week of being born. “We found that if we fed the babies and wrapped them up tightly, they would fall asleep,” recalled Prof Chong, a senior consultant in the National University Hospital’s obstetrics and gynaecology department. When the children were older, research teams decorated equipment to look like spaceships or submarines. The children were encouraged to imagine that they were going on an adventure. “I remember seeing all the fish in the submarine. There was an octopus too,” said Marully Ioseff Benjamin. Prof Chong and his team also organised regular meet-ups for participants to build “a sense of community and belonging”. The researchers originally received a $25 million grant in 2008 that was supposed to last five years. “We decided to design the ultimate study from our point of view,” said Prof Chong. “We had so much data that one of the challenges was getting enough people just to work on it,” he added. In 2014, the study received $23 million in fresh funding. If funds allow, Prof Chong hopes to study the children until they are 25. This will mean learning how a child’s earliest years could affect his performance in the Primary School Leaving Examination, his development during puberty, and even how he copes with his first job. Parents who have stayed with the Gusto study all these years like that someone is keeping a close eye on their health and that of their child. “When I was pregnant, I found out that I had gestational diabetes. Maybe I would only have found out at a later stage otherwise,” said Ms Challa Srujana, 33. The business analyst, whose son is now seven, also appreciates that she gets a copy of all his test results – from MRI scans to allergy tests. The idea of studying an entire generation of babies is not new. What makes Singapore’s Gusto study so special is the way it tracks the minutiae of each baby’s life, from the day of birth. The Helsinki study is one of the landmark pieces of research in this field. It involved more than 13,000 people, but did not study them in such great detail. Findings from the Gusto study – Gusto is short for Growing Up in Singapore Towards Healthy Outcomes – have changed national health policy. Previously, said Professor Chong Yap Seng, doctors screened only women deemed to be at high risk for gestational diabetes. It was believed that around 8 per cent of women had the condition, which can have a lifelong impact on both mother and child. Via the Gusto study, however, doctors found that the actual figure was nearly 20 per cent. Now all women are screened for the condition. Researchers have published a total of 169 papers on the Gusto findings. Although the study is a local achievement, said Prof Eriksson, it has implications for the health of millions around the world. “People think of it as a Singapore study, but there are three different ethnic groups and they comprise more than 40 per cent of the world’s population,” he added. ​Source: The Straits Times, Singapore Press Holdings Limited. Reproduced with permission.